Mega Man 9 arrives today on the PSN! Go Hands-on with Valkyria Chronicles this week! Get Your BUZZ! Face On Tomorrow! Here's how you change from the standard Live Channel in Life with PlayStation to the folding@home graphical interface. Hold down the Square button and you can switch between both interfaces. Help Save Gotham! Limited Edition PlayStation 2 LEGO Batman Bundle on Shelves Today! Its Official! - LittleBigPlanet on shelves 10/21/08! UPDATE: Mega Man 9 coming to PSN on September 25! !New exclusive boss artwork.New website : http://megaman.capcom.com New game package.Mega Man 9 coming soon to the PSN for $9.99. Nuff said. 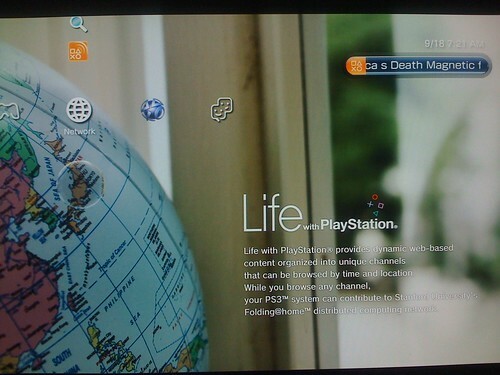 Here's the custom music player from Life with PlayStation. Press the Square button twice and the mini player will pop up. It also shows you the folding@home progress. U.S. MyBUZZ Launches Prize Opportunities! Here are 28 awesome screenshots from MotoGP 08 from Capcom. We can't wait for this game to come out. Also check out the gameplay footage all the way down. Hopefully Polyphony Digital will step up with a Tourist Trophy for the PS3.